Today at Jeff's office they were having a Halloween potluck, so we decided to make a couple things for him to bring in today instead of doing a Wednesday Treat Day. I did everything yesterday, but didn't get around to posting until today! Some of his co-workers have been asking if we could make the Outrageous Oreo Crunch Brownies that they've seen on the website. Now, even though we have posted about these a couple times before and we rarely do repeats - this is one recipe I will glady make at any time! The last time we made them was for the Phoenix office, so it was only fair we should make some for the new office... right? The only thing I did different from the recipe is using the orange Halloween Oreos. I thought it was great that the bright orange color stayed after being baked and cut! 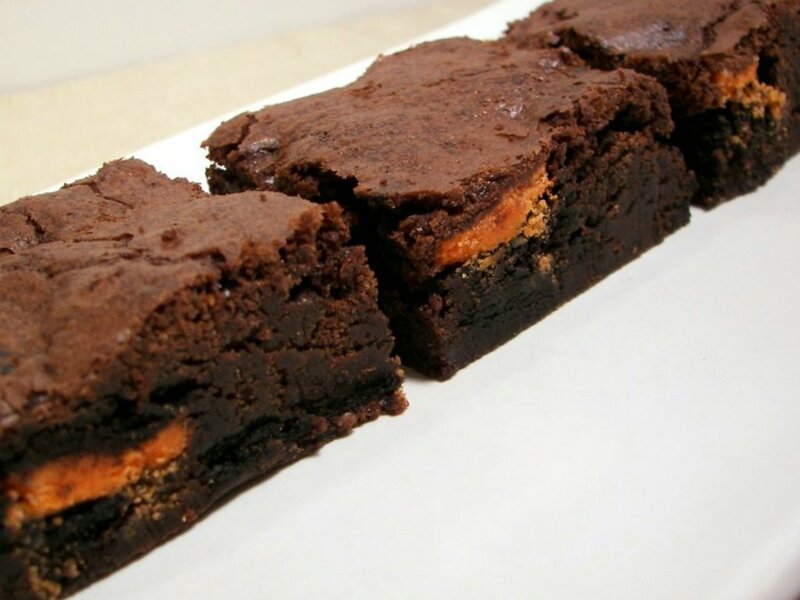 As always, this recipe is one that never disappoints as the brownies cut clean, are oh-so-fudgy, extremely rich and yes, they live up to the name of being outrageous! At the last minute, I decided I wanted to make something else - I thought some homemade mints might be a nice addition to their dessert table. Mom makes these Cream Cheese Peppermint Mints all the time for weddings she does or whatnot as they can be done in advance. They keep very well in the freezer or refrigerator. This is a very basic recipe - softened cream cheese, confectioners' sugar and a bit of peppermint extract are combined until the mixture is no longer sticky. I decided to color the dough orange and black (well... as black as my gel would take it). 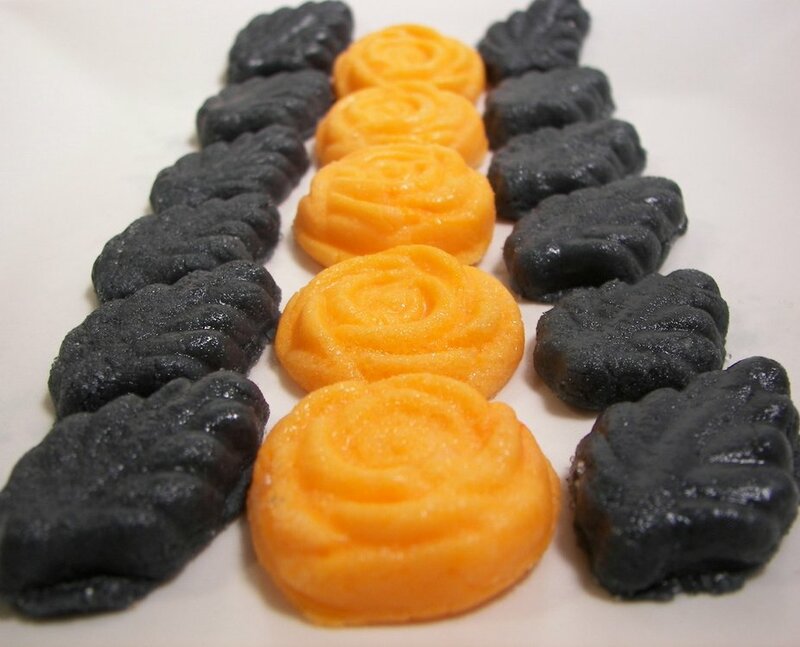 You take small pieces of the dough, roll in superfine sugar and then press in a candy mold. I used small individual and flexible silicone molds as they are easy to pop the candies out. The mints are velvety soft, creamy and are very refreshing to have after a meal. 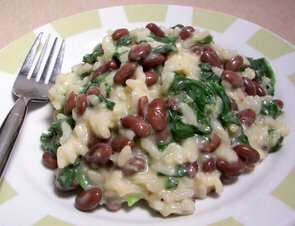 Dinner tonight, Black Soybean Risotto with Spinach, was the first time I've used black soybeans before. I'm not sure if there is more than one brand, but the only can I could find was made by Eden Foods. If risotto is something that scares you off - don't be afraid. It really is not too difficult, you just need to stay near the stove to stir the pot - that's it! Warm vegetable broth is the liquid of choice here with a base of onions, garlic, fresh ginger and rosemary. Once the rice has toasted and it has absorbed the batches of liquid (this will take around 20-25 minutes of stirring), you add sharpness and protein to the risotto with Parmesan and the black soybeans. Fresh spinach is added in handfuls until it wilts down and the dish is finished with a pat of butter to lend a needed touch of richness. Creamy, quite filling and a satisfying way to enjoy rice - I also liked how these beans didn't have an overwhelming "soy" taste to them. We did rush the photo taking along as we had to answer the frequent knocks on the door looking for candy! With the clock rolling back yesterday, I was a little surprised to see just how early it gets dark outside again. It was nice not having to worry about changing the time when we lived in Arizona - now it seems to be very dark when it is only 5:30! Since we are still trying to get used to the chilly temperatures, I'm trying to make sure we have a stomach warming soup at least once a week. Tonight's meal was one of comfort foods - Roasted Tomato Soup with Garlic and a side of grilled cheese! The soup could not have been more simple - since we are pretty much out of tomato season, we used canned fire roasted tomatoes. Fresh garlic goes for a dip in olive oil until you begin to smell its fragrant aroma. The tomatoes, along with vegetable broth and a dash of crushed red pepper, are stirred in and brought to a boil. This mixture slowly bubbles away until it's ready to be annihilated by an immersion blender. Once smooth (or to the consistency of your liking), the only thing that is needed is a scattering of chopped basil for a punch of freshness to compliment the roasted tomato flavor. 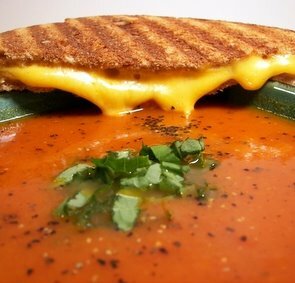 I used The Griddler to quickly get the grilled cheese made and we were off ready to be warmed up with a toasty sandwich that was aching to be dipped into the warm satisfying soup. A note for when I make this again... a splash of good quality balsamic vinegar might be a fun way to add another dimension to the soup. With the kitchen remodel coming to a close (should be totally finished this week... *crosses fingers and toes*), we certainly made quite a few recipes - 15 new ones for this week! Going back, I think the standouts were the Chocolate, Fig, and Marsala Pastries, Chocolate Peppermint-Toffee Crunch Cookies and Chocolate Chip Pumpkin-Spice Bars. 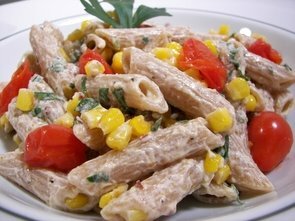 Tonight's dinner, Smoky Whole Wheat Penne with Corn and Cherry Tomatoes, gave me a reason to use up some goat cheese I had lingering in the refrigerator. The recipe didn't call for it, but I gave the corn kernels a quick saute in butter to give them a toasty flavor. Jeff is not too crazy about raw tomatoes, so I threw them in the pan for a minute or two to soften. While you wait for the pasta to cook, smoky chipotle chilies and fresh garlic are quickly cooked until fragrant. Goat cheese and a splash of water are added to cook down into a thick creamy sauce. Cilantro and a touch of olive oil are stirred in to give the sauce a bit of richness. The al dente penne, golden corn kernels and halved tomatoes are then gently tossed in the smooth sauce. With a spicy and tangy sauce, this hearty dish makes four generous servings that are very filling with a light side salad. 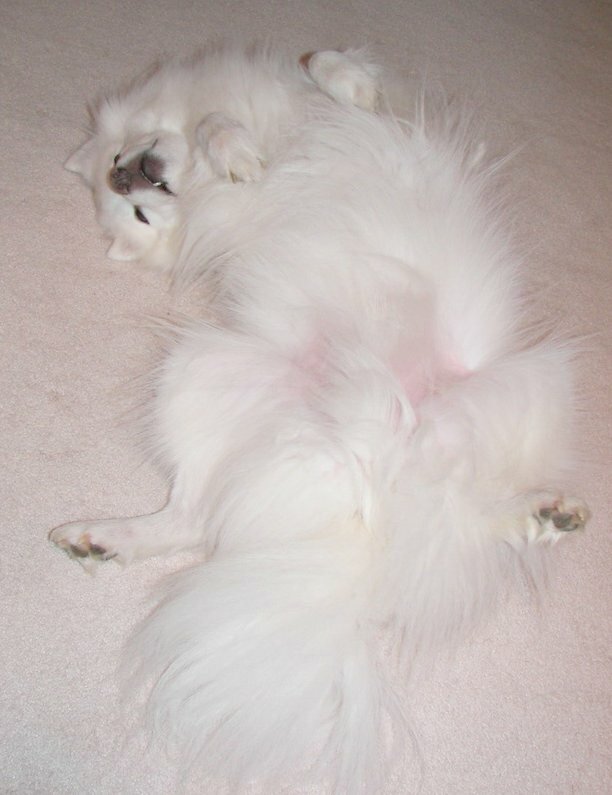 Okay.. please forgive me, but we are not pumpkined out yet! Yes, another post involving a baked good with mashed pumpkin! 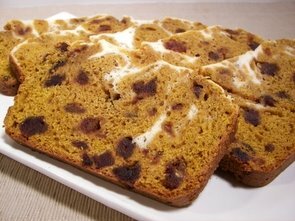 Today's recipe, Pumpkin-Date Loaf with Cream Cheese Swirl, has a sweet and moist orange tinted interior with a cheesecake-esque topping. While this recipe ends up using a few bowls, it was fairly quick to throw together and get in the oven. 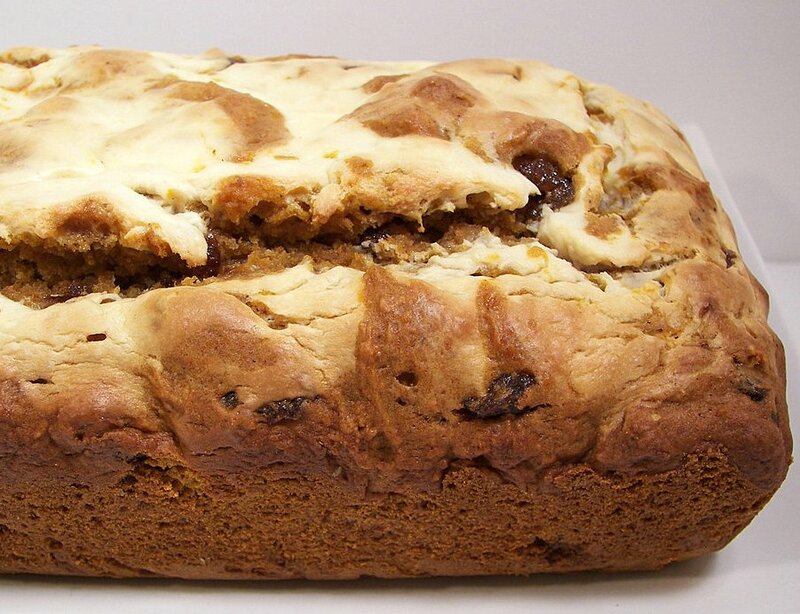 Dark brown sugar, along with the dates, bring a rich sweetness to the soft textured loaf. Next time I make this, I may reduce the sugar - I think it teeters a bit too heavy on the sweetness scale. 1/4 cup or so less would be a good reduction without affecting the quality of the bread. 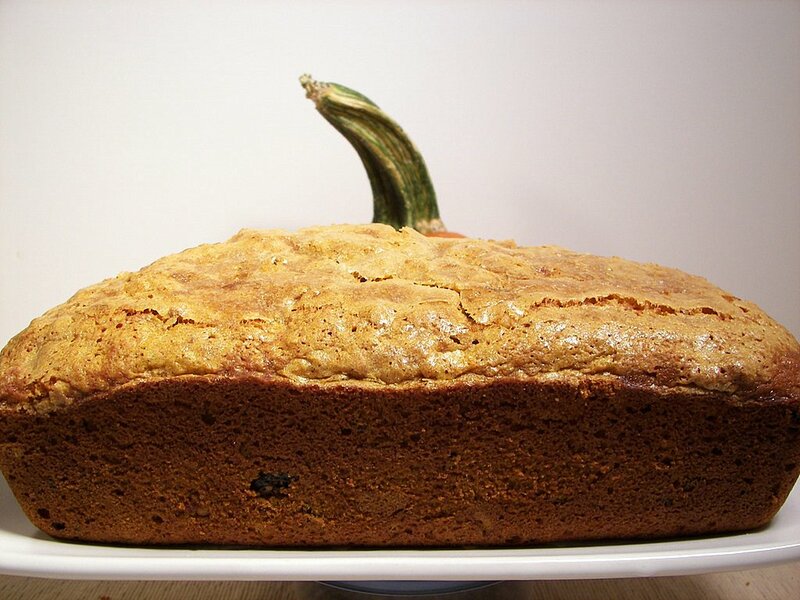 The pumpkin is mild, but the stronger spice combination perked up the flavors just enough. The white top is striking, but I think I would prefer to do the topping as a filling. 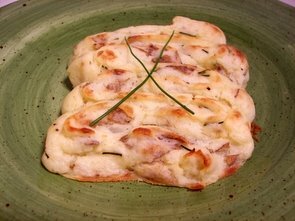 The batter for the bread is quite thick and does not lend itself to swirling well. I've been reading through this cookbook, King Arthur Flour Whole Grain Baking , since I bought it from Amazon a few weeks ago and finally picked out a recipe to try. This book is filled with recipes calling for flours and ingredients I've yet to use, like barley flour, which is one ingredient feature in today's round of baking. I went for the fairly basic recipe of Rosemary-Asiago Chop Bread. Because this bread uses mainly whole wheat and barley flour, don't be disappointed as it will not really bake into a high rising loaf. We found the bread to not be too "wheaty" as the barley flour seems to pacify the stronger taste. Once the dough has risen for the first time, it is easily flattened into a large oval to begin an interesting filling process. 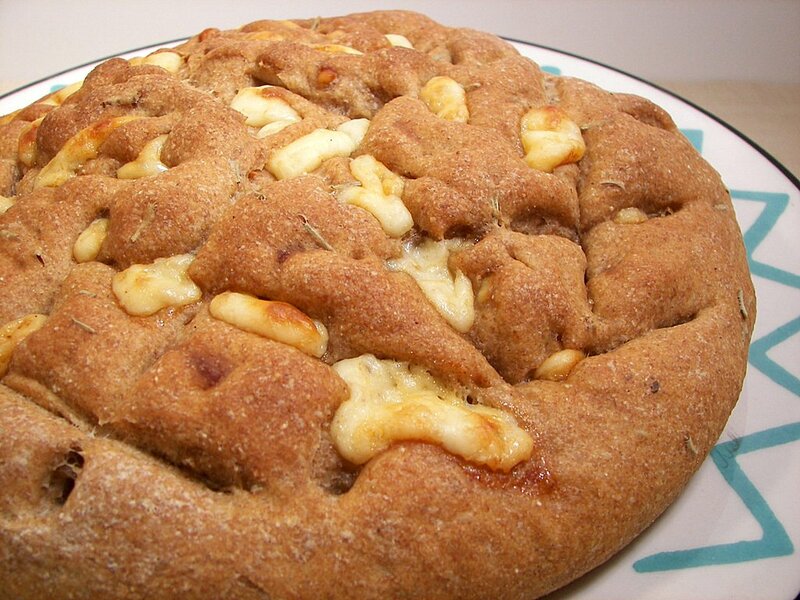 On one side of the dough, chunks of sharp Asiago cheese are placed on top and then covered with the other half. This is then formed into a circle and placed in a cake pan where you get to have a little creative fun! 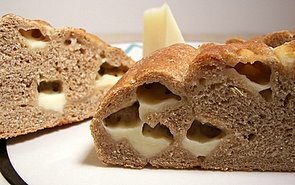 Using a bench scraper, you randomly chop all over into the dough to create a ragged top so the chunks of cheese are allow to peek through. As this rises and goes through the baking process, the dough slowly "heals" the cuts you made and the cheese melts into gooey pockets of love. 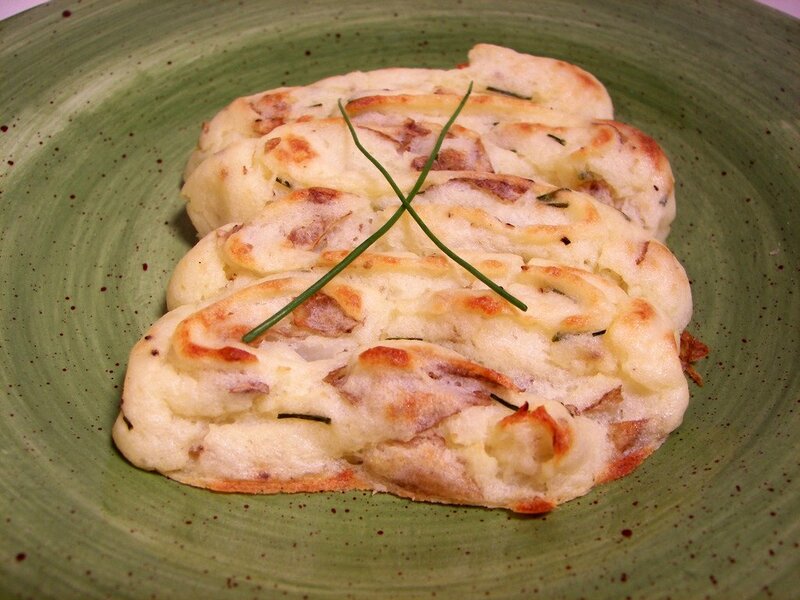 Rosemary was an excellent choice of herb as it is very distinct and matched well with the Asiago. I choose to cut the bread into chunky wedges, but you could slice this into thin pieces that would make for a fantastic piece of toast. Dinner tonight, Garlic-Chile Flank Steak, was the topping for a quick salad I threw together. I marinated the steak for a couple hours in a mixture of fresh garlic, white vinegar, canola oil, ground ancho chile, oregano and cumin. This combination gave the steak a complex smoky flavor, without adding much heat. Ancho chilies are just dried poblanos, which are more mild and sweet than spicy. If you can't find them, you could use chili powder - but do add a small pinch of cayenne for a little kick. We prefer steak to be around medium to medium rare, so I cooked it until the center was still fairly pink. 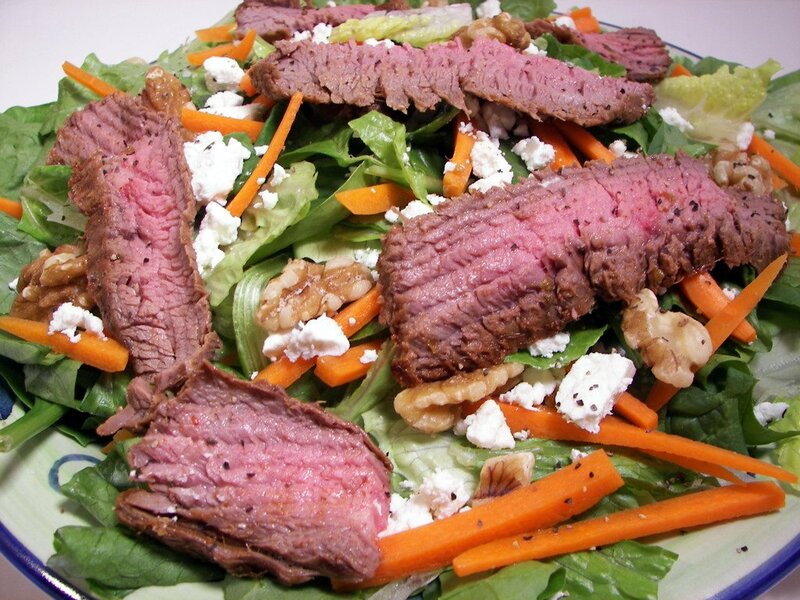 Under the steak was just a quick mix of crisp romaine, fresh baby spinach, carrots, bits of goat cheese and toasted walnuts. This recipe also gave us just enough extra steak to make a killer sandwich for lunch tomorrow! We love potatoes and I'm always looking for new ways to serve them. Tonight's side is a groovy take on regular mashed potatoes. Duchess potatoes are rich individual-sized portions that are baked after being mashed. Butter and sour cream are mixed into the soft potatoes to ensure they stay creamy. Once combined, egg yolks are mixed in to help the potatoes hold their shape for the trip in the oven. After chopped fresh chives are added to brighten the flavors, (Jeff made a comment while I was mixing them that it smelled like a just opened bag of sour cream and onion potato chips...) the mixture is placed in a pastry bag and ready to be piped out. Jeff and I prefer leaving the potato skins on, so I used a plain tip to pipe the portions out. If you prefer peeled potatoes, be sure to use a star tip to get a more impressive design. The potatoes are then placed in the oven until they slightly puff up and achieve a golden shell. While they are a little crisp on the outside, the insides stay warm and creamy - a pleasing texture difference. Such a fun way to serve individual portions of mashed taters! If you are so inclined, you can make these ahead of time up to the point of piping them out. Just cover them and set in the refrigerator until you are ready to bake. While tonight's dinner, Southwestern Chicken Chili, was not an outstanding chili recipe, it was certainly comforting and fairly quick to prepare. 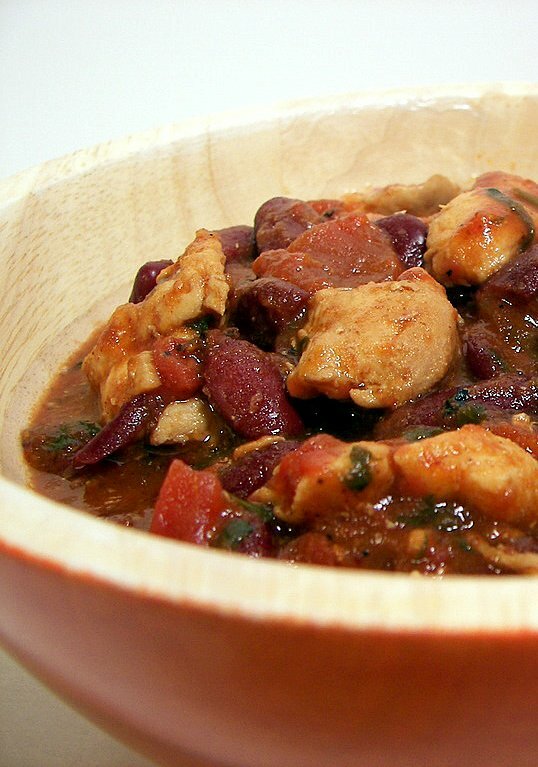 What made this chili a bit different from ones we have made before is the addition of a strong brewed coffee. I could not taste the actual coffee flavor, but we both felt it added a needed depth of flavor to the chili since it cooks fairly fast. This dish is fairly mild in the spice category, so I would probably add additional heat in some form if I were to make this again. To give the chili a little more body, masa harina dissolved in water, is added in midway through cooking. The ratio of meat, beans and chunky bits of tomato was pretty good as you seemed to get a bite of each in every spoonful. I talked about a recipe for Sesame Twists that we had with the soup last night. I ran out of time to get them posted, so I need to play a little catch up with them first. If you have a fear of yeast (which you shouldn't! 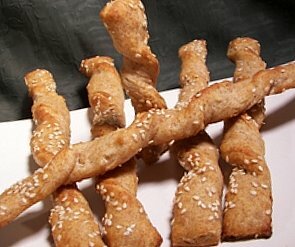 ), these breadsticks are just the thing as this recipe uses baking powder for lift instead. Though you do need to wait for the dough to chill, these can be quickly thrown together in the morning if needed, then rolled out and baked later in the day. These golden twists are crisp and very buttery, after all there is a whole stick mashed in - but, you do get 30 breadsticks out of one batch. Nutty whole-wheat flour is mixed with all-purpose which keeps them from being too heavy. Buttermilk keeps them tender with just a hint of sweetness from a small amount of sugar. The crunchy sesame seeds set these apart - be sure to sprinkle them with a little coarse salt when you add the seeds to enhance the flavor. The dough is a little delicate, so try not to be too rough when you are twisting them. 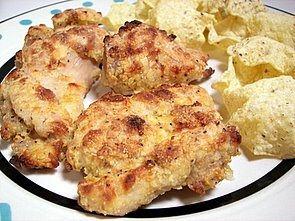 Since I was going to have leftover buttermilk, I opted to make a recipe for Oven-Fried Chicken for dinner tonight. What makes this a little different than most "oven-fried" recipes is that you actually start browning the chicken in a hot skillet before they go in the oven. This gives the crust a head start to get crispy in the oven. Cornmeal is mixed with some slightly spicy seasoned flour to ensure you get that crunch when you bite into them. The original recipe called for bone-in breasts, thighs and legs, but I rarely have them in the freezer... I ended up using all boneless chicken thighs instead. Just be sure to adjust the final time in the oven depending on which chicken pieces you use. The chicken was tender, moist and had a very subtle tang from the buttermilk - next time I may let the chicken sit in the buttermilk mixture for a little while before I start dredging them. To make sure the bottom of the chicken stays crunchy, I preheated the baking sheet for a few minutes before adding the chicken - you could skip this, but I do find it makes a difference! One of the better "oven-fried" recipes we have tried thus far! It has been quite the busy day around here... lots of people coming and going that are working on the kitchen - we are probably within a week or two of being done (hopefully!). I was not sure I was going to be able to make anything for tomorrow, but I found some time to throw together a new bar recipe for Jeff to bring into his co-workers for Wednesday Treat Day. I'm all about pumpkins lately and today's baking of Chocolate Chip Pumpkin-Spice Bars certainly made a dent in my mashed pumpkin stash. 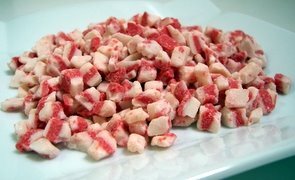 The amount of certain ingredients may be a little shocking compared to what we would normally do, but keep in mind that these are cut into small squares. Three of my favorite spices, Vietnamese cinnamon, ginger and cloves infused their fallish aromas into the house while these bars baked - a few of the workers commented that they could work here everyday! 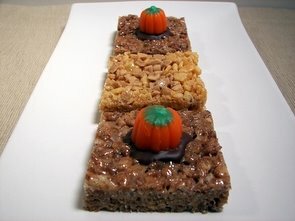 I used mini chocolate chips in these bars as I find they are better dispersed in batters and are less likely to sink, but you could certainly use raisins or even no mix-ins if you prefer a plain pumpkin flavor. I highly suggest some chocolate though! On top of these golden moist gems is a generous slathering of a luxurious sweet cream cheese frosting. In the interest of variety, I left some plain, topped some with chopped toasted walnuts and the rest were adorned with a grating of bittersweet chocolate. These may just be my new favorite fall-time baked good. 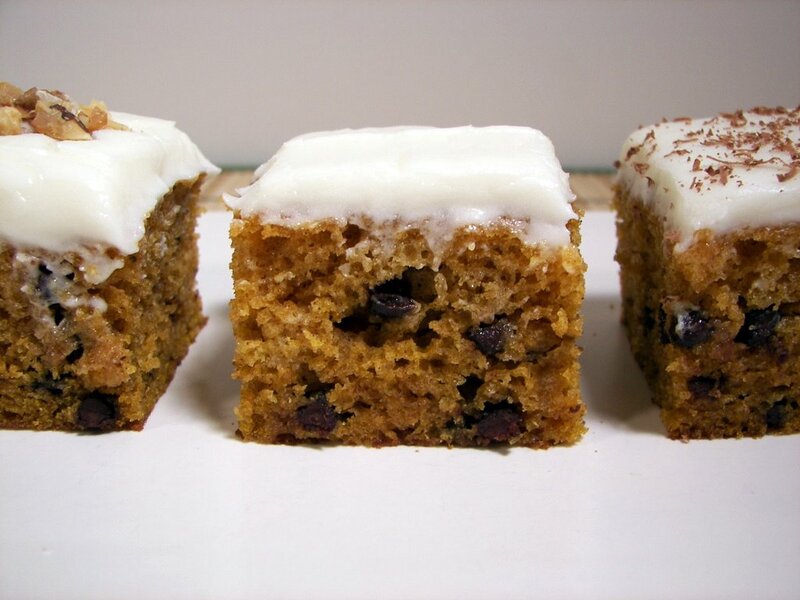 The pumpkin flavor is very present with just enough boost from the spices to heighten the flavors. It also gets bonus points for not being fussy and using up a bunch of pantry ingredients. With all the activity, I only had a short time to prepare dinner tonight, so I opted to make Stracciatella Soup. 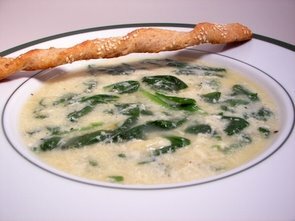 This Italian egg drop soup took less than 15 minutes to make with most of the time just waiting for the pasta to cook. We simmered orzo in a mixture of vegetable broth and water - when the pasta was tender, we mixed in baby spinach and waited a minute for it to wilt down. 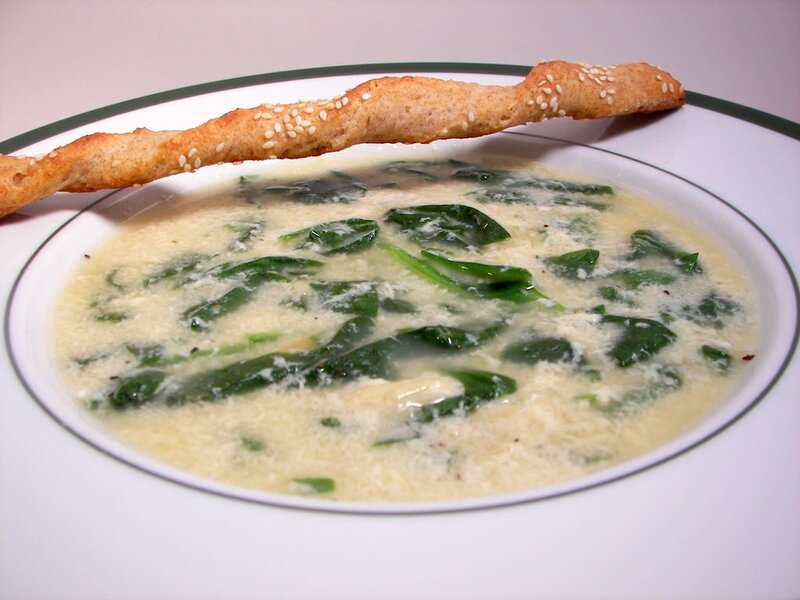 A couple eggs and sharp Parmesan cheese are then whisked together and slowly drizzled into the hot soup. Be sure to do this off heat so the eggs don't cook to quickly - as they are drizzled in, they form little strands that fill the soup pot. While this was light, it was quite refreshing and filling being divided into two portions. I did serve this with some Sesame Twists I made early in the morning before it turned into a mad house, but I'll talk about those tomorrow! The recipe sections to the left has been brought up to date again - be sure to hit refresh to see the new additions! Blogger has been having issues all weekend and it seems that they are still having problems today - sorry if any comments are not getting through. It seems yesterday's post was eaten, but I'll try to get it back up if I can. I love this time of the year as all the new holiday baking products come rushing into the markets. We happened to find these little guys this weekend and I picked them up/put them back at least twice... I couldn't help it though, we had to get them. 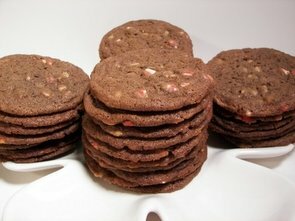 I created this recipe today, Chocolate Peppermint-Toffee Crunch Cookies, so I could try these new chips out in a cookie. I wanted a thin, chocolate-y and crisp - yet chewy cookie and I think we hit the spot with them. I used a cup of the peppermint chips and a cup of toffee bits - the flavor is decidedly peppermint, but has a hint of caramel in the background. The melted toffee also helped to keep them chewy. The chocolate flavor is mild, but it kept the peppermint flavor from being too strong. Don't be afraid of the vinegar in the ingredient list - I've used it before and it keeps the cookies light and I think helps with the crispness. I do want to tinker here and there with the recipe, but Jeff thinks it is good as is. Dinner tonight uses quick-cooking couscous that is great for when you're running behind on a weeknight. 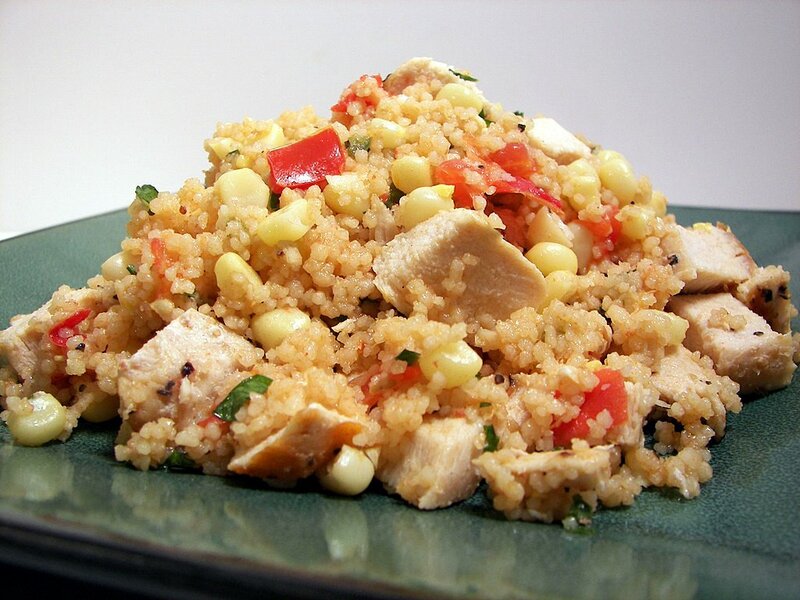 Southwestern Couscous Salad begins with a quick cook of some lightly seasoned chunky turkey breasts. After some chicken broth comes to a boil, frozen corn is added and allowed to briefly cook. Nutty whole-wheat couscous is stirred in and the mixture is left to sit and cook for 5 minutes. We then made a dressing of fresh lime juice, oil, cumin and a dash of cayenne pepper sauce to add some heat. 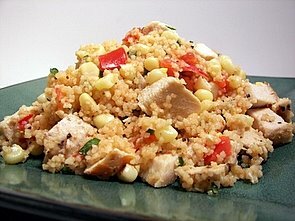 Diced tomatoes, fire roasted red bell peppers and cilantro are tossed with the cooked turkey breast and couscous - then a drizzle of the tangy dressing brings the dish together and keeps everything moist. 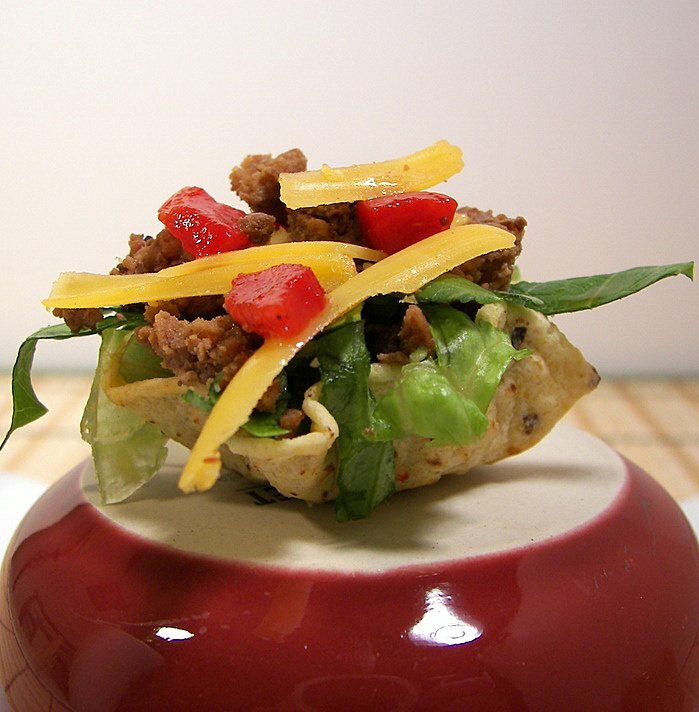 Fast, healthy and packed with flavor - can't get much better when your short on time! We may not have much in the way of a kitchen still, but we did manage to kick out 14 (including today's and a couple we didn't even have a chance to talk about yet) new recipes this week! Lasagna Soup, Peanut Butter and Chocolate Bundt Cake and the Bulgur Pilaf with Potatoes and Pistachios were the highlights during the week for us. Today I made double batch of a sweet dough that I used to make two pastries. In the recipe for Sweet Cream Cheese Dough, the butter is cut with cream cheese, so while the resulting dough is quite tender it is not super-flaky. I found the dough pretty easy to roll out and work with - not very sticky at all. Since most of the work is done in a food processor, it is a snap to throw together and most of the time spent is waiting for it to chill down. 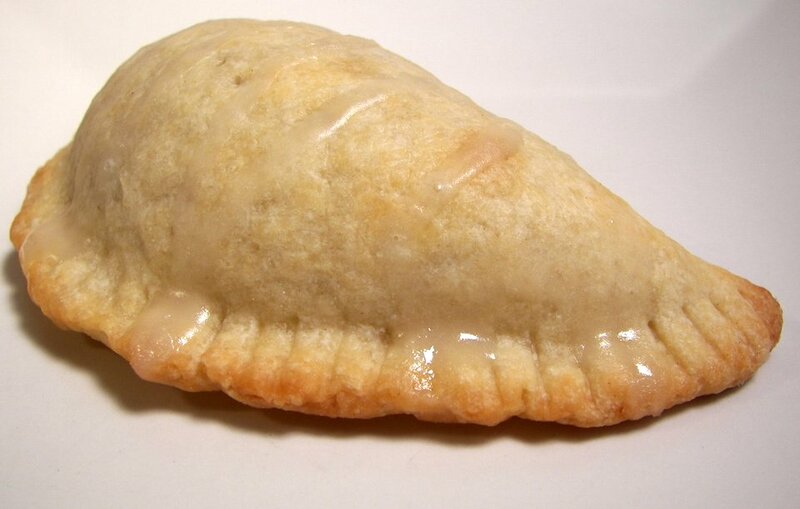 The first pastry I made was Creamy Apple-Cranberry Turnovers. I started by cooking down tart Granny Smith apples until they were tender and beginning to caramelize. Brown sugar, dried cranberries, cinnamon and nutmeg are mixed in to sweeten and mellow the tartness. Cream cheese, sour cream and vanilla are added in once the mixture cools down to create a scrumptious creamy filling. This is then placed in the center of the rolled out sweet dough. The edges meet and a fork seals the deal to ensure the filling stays inside. Before baking, they go in the freezer for about 30 minutes to set the dough and allow it to cook evenly. After baked and cooled, a thin glaze of confectioners' sugar, milk, sour cream and a dash of vanilla is drizzled on top for a sweet finish. 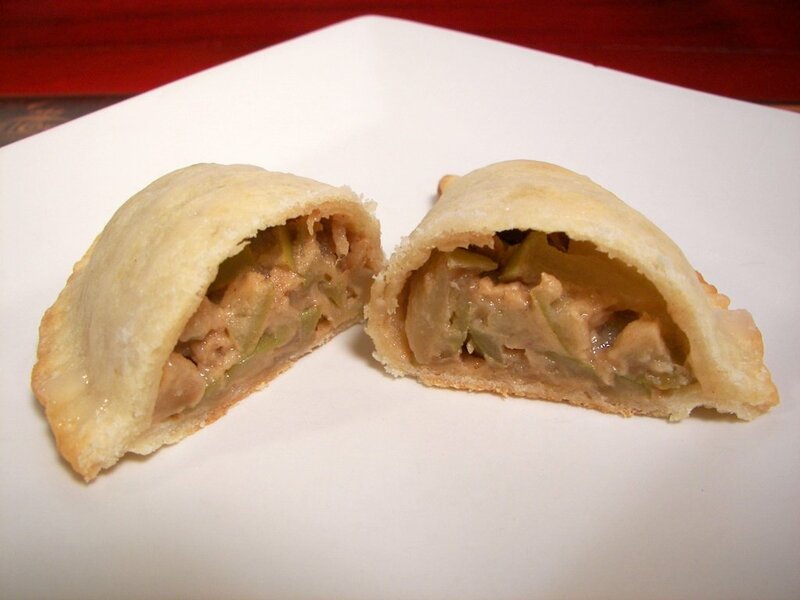 The creamy inside with chunks of tender apples and cranberries was a good match to the tender yet crisp dough. 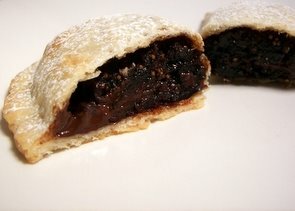 The next one, Chocolate, Fig, and Marsala Pastries, was fun to say but turned out so much better than I expected when I took my first bite. Dried black mission figs are first steeped in a bit of water combined with a sharp Marsala wine. Once the figs are tender, the mixture is set in the refrigerator as it needs to cool completely. When you are ready to make the pastries, you mix in an egg yolk and chunky bits of bittersweet chocolate to the cool figs. 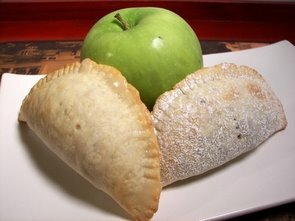 The filling and baking process are the same as the above turnovers. 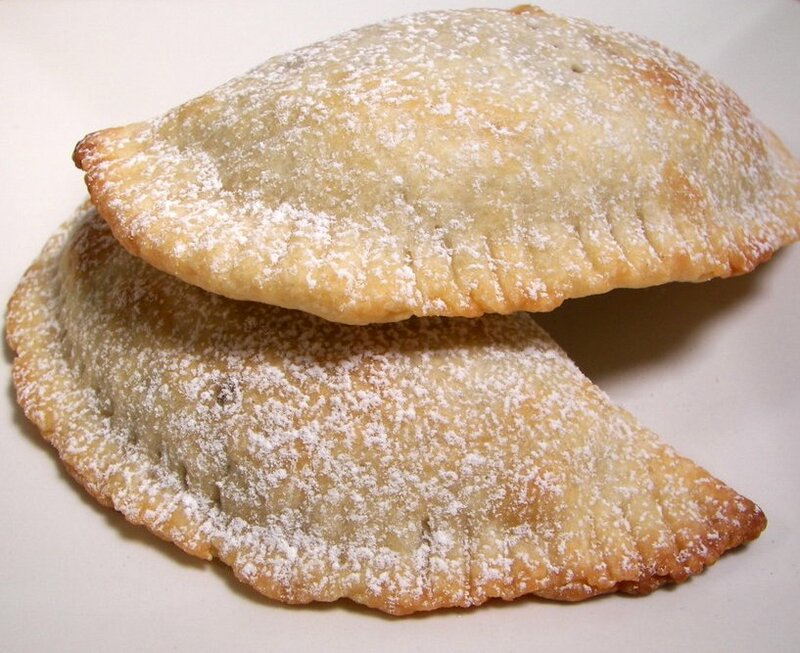 When the edges of the dough are golden, they are removed, cooled and a shower of confectioners' sugar on top is all these need. The slight smokiness of the Marsala penetrates the sweet figs and compliments the bitter chocolate in this exquisite pastry. In both cases, I might give them a brush with milk or an egg wash to help color the dough as it bakes - it does stay a bit more pale than I would have liked. Back when we first moved to Phoenix, Jeff immediately made friends with the admin for their team, Trish. She eventually moved out of the country with her husband and just recently came back and bought a house here in the states. She's living with some family in the interim that happen to be just a short drive away, so we decided to try and meet for lunch. 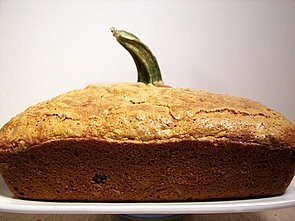 We decided we wanted to make something to bring to her, something fallish, so we opted for a pumpkin bread! 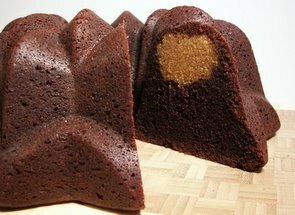 This recipe, Cranberry-Walnut Pumpkin Bread, is put together cake-style, rather than a quickbread, as the butter is creamed with sugar instead of adding the sugar to the dry ingredients and adding oil or melted butter. For spices, I added Vietnamese cinnamon, ginger, allspice and fresh grated nutmeg - but you could simplify and use a pre-made pumpkin pie spice (use about a tablespoon). Buttermilk is the liquid of choice, but you could use a yogurt if you didn't happen to have some on hand already. Toasted chopped walnuts and sweet dried cranberries are folded in and once the batter is scooped into the pan, I scattered the top with a shower of vanilla sugar. I keep a separate tub of sugar that I use to place spent vanilla bean pods in and just keep replenishing with more sugar when I use it. The sugar takes on a pleasant, but light vanilla scent and is wonderful to sprinkle on muffins or to add another depth of flavor to baked goods. The buttermilk keeps the bread tender and lends a mild twang. 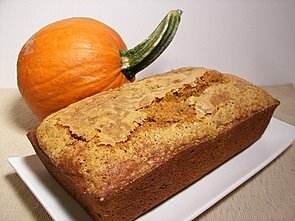 Besides adding flavor, the mashed pumpkin keeps the loaf plenty moist as well. I would like to try this recipe with some fresh cranberries and turn this into a muffin next time. No real updates on the kitchen just yet - we are coming along, execpt we found out the installer had issues at another site they are working on. I have a feeling we may be delayed now, but we knew something would come up as things were going a bit too good! 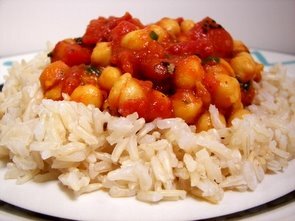 Tonight's dinner, Tomato Chickpea Curry, was certainly packed full of flavors and had just enough of a kick to it to keep us warm in the cool basement. The base is formed by sautéing onions, fresh ginger and garlic in a bit of canola oil. Garam masala (an Indian herb mixture of sweet and hot spices), brown mustard seeds and red pepper are added to the mix and allowed to toast until they release their fragrant aromas. Creamy coconut milk along with a jalapeno, sugar, turmeric, chickpeas, fire roasted diced tomatoes and plain tomato sauce are added and allowed to simmer until the mixture thickens. Cilantro is folded in once the pan is removed from the heat to freshen up the flavors. This is pretty saucy, so I served it over brown jasmine rice. I would suggest using the brown mustard seeds as they add a depth to the heat in the dish, but you can use yellow mustard seeds if you can't locate them. While we both did like this dish, Jeff thought it was a little too acidic for his tastes. I decided to give last night's mess another chance at lunch today. The noodle texture was actually better and the flavors seemed to be more cohesive - but, it could just have been because I was pretty tired and hungry from mowing the lawn for 3 hours. Hopefully it was for the last time as the weather is getting pretty cool. Both dishes we had at dinner tonight blew away any sorry memories from last night. 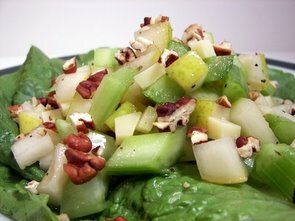 I started by making a quite simple side of Crunchy Pear and Celery Salad. I began the recipe by soaking celery stalks in icy water to crisp them up. As the time passes, you make a modest dressing made from raspberry vinegar, honey and a dash of salt. The salad itself is a combination of the crisp celery, diced pears, chunky bits of sharp white cheddar and nutty toasted pecans. 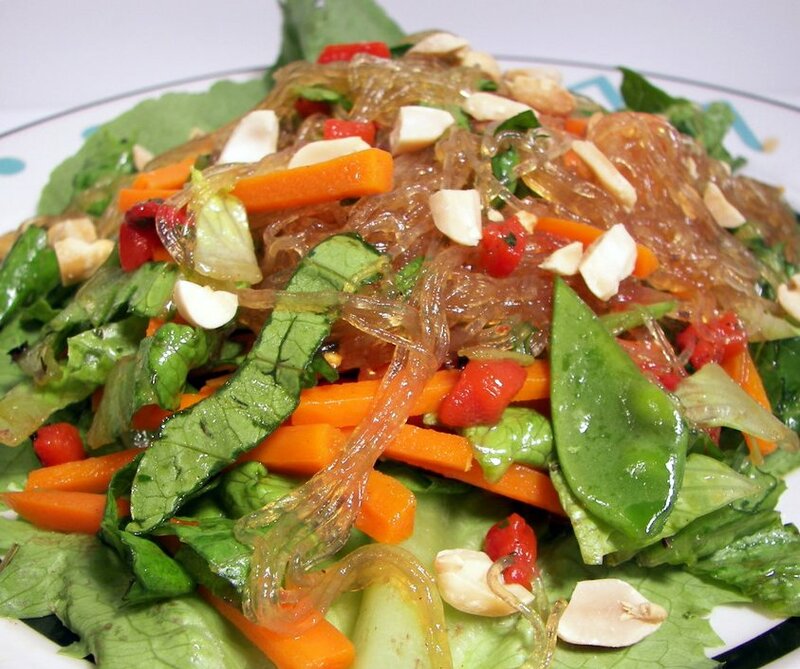 The dressing kept the balance of flavors in check and the slight sweetness from the honey worked well. 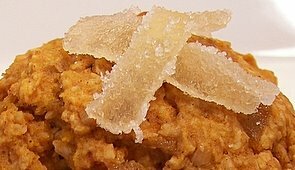 If you don't like the specific cheese or nuts we used, I think the flavors in the recipe would easily adapt to which ever combination you would like. You can even make this a couple hours ahead of time, but just hold back on the nuts until right before serving. 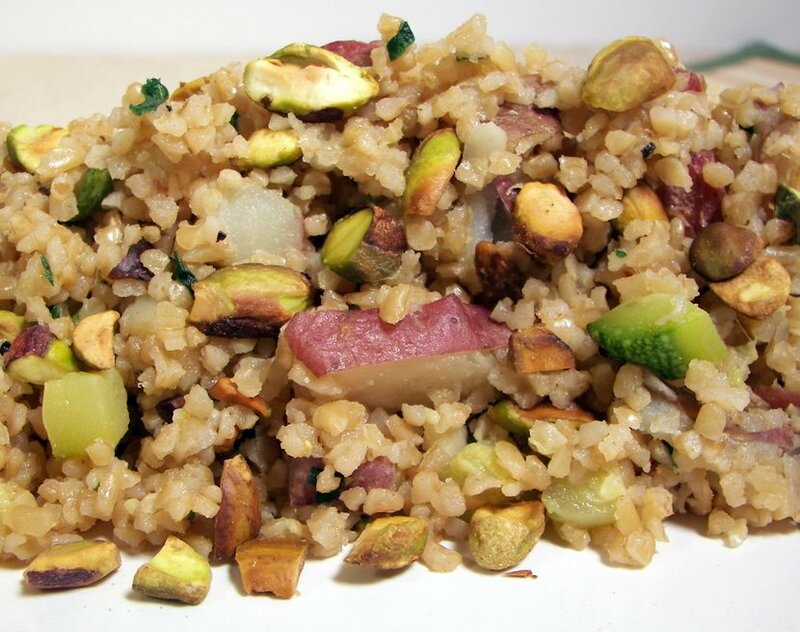 I had no idea just how well pistachios and potatoes went together until we had tonight's one pot dish of Bulgur Pilaf with Potatoes and Pistachios. Diced new potatoes are sauteed in a bit of olive oil until the light white flesh turns into a rich golden crust. Chopped zucchini and fresh garlic are added in and left for just a minute to get a light coating of the oil. The vegetable mixture is removed and the dry bulgur, shallots and coriander are tossed in to begin toasting - this should not take more than a couple minutes. It may be hard to see a color change while the bulgur is in the pan, but it is ready when you begin to smell the nutty aroma that is released. The vegetables are added back in along with vegetable broth, this mixture is left to simmer until the bulgur drinks up the flavorful liquid. Once it's ready to serve, a generous amount of chopped toasted pistachios and fresh parsley are added into the mix. The tender potatoes and crunchy toasted pistachios added to the filling nature of this vegan main dish. I've never really thought of using bulgur as the grain in a pilaf, but it worked so well here and the quick cooking time was a nice benefit. Over the years I have been pretty good at picking and choosing what recipes I end up making and have had very few duds. Tonight though, was certainly the exception! Fair warning... It's not that they were inedible, they just didn't do much for us and I would not make them again. Tonight's side dish, Brussels Sprouts with Sherry-Asiago Cream Sauce, was the better of the two though. I knew it was not going to go over well already with Jeff, as he has never really cared much for Brussels sprouts - but I keep trying. 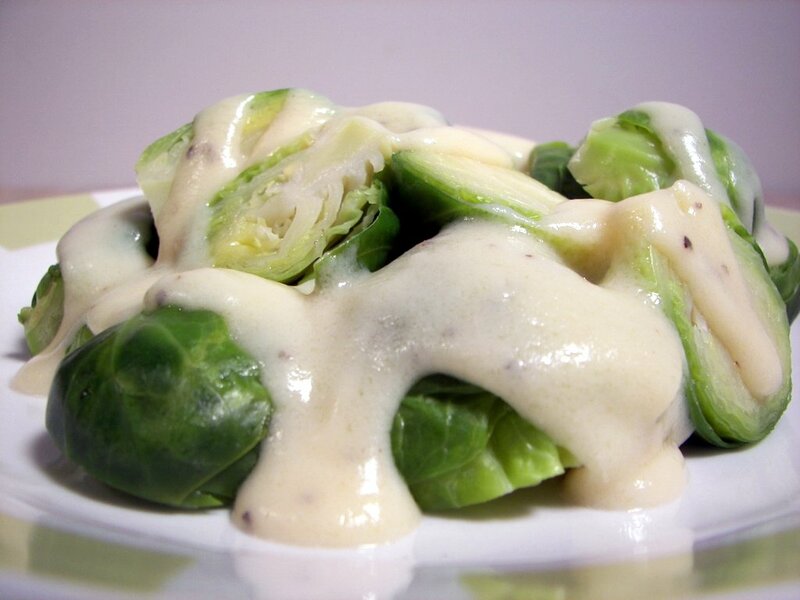 As the Brussels sprouts steam, a thick sauce is made from shallots, milk, dry sherry and Asiago. The sauce was actually pretty rich, tasty and smooth when it was right out of the pot, but it began to get a little pasty after sitting for just a couple minutes. While I did think the total package was not bad, I would probably choose something else if I were to look the recipe over again. With the oven back, we are able to continue on with baking for the weekly Wednesday Treat Day that Jeff does for his co-workers. I've heard through the grapevine that some sly people have figured out that we post the treats the day before Jeff brings them in and they come to sneak a peak at what Jeff will be bringing... hmm, I wonder if we should play a trick on them one day! For a change of pace (and I wanted to make full use of the oven), I opted to make a cake. 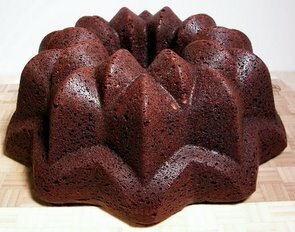 Not just any cake, but a Peanut Butter and Chocolate Bundt Cake. This is not a dull chocolate cake flavored with peanut butter, but an intense and rich double chocolate cake with a sweet and thick hidden ring of luscious creamy peanut butter mixed with cream cheese. 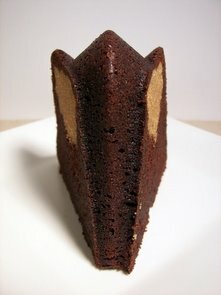 Two forms of chocolate, natural cocoa powder and chopped bittersweet chocolate, make for a dark cloak to off-set the light filling. 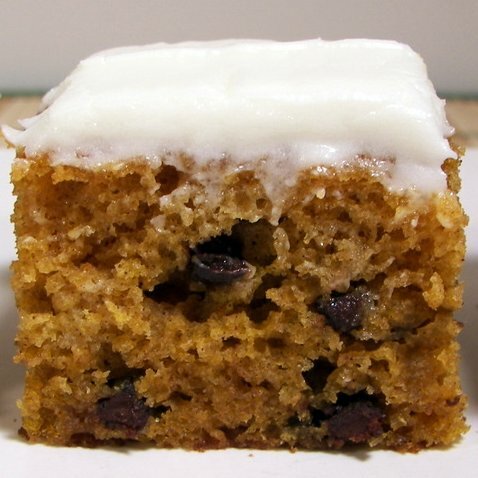 Sour cream is used in the cake batter which keeps the cake extremely moist. Between making the filling, the batter, combining them and the baking, it does take quite a while from start to finish, but the joy of eating a sliver certainly made up for it. I'll be sending along some whipped cream and chopped peanuts if they wish to gild the lily, but I thought this cake needed nothing else but a fork. 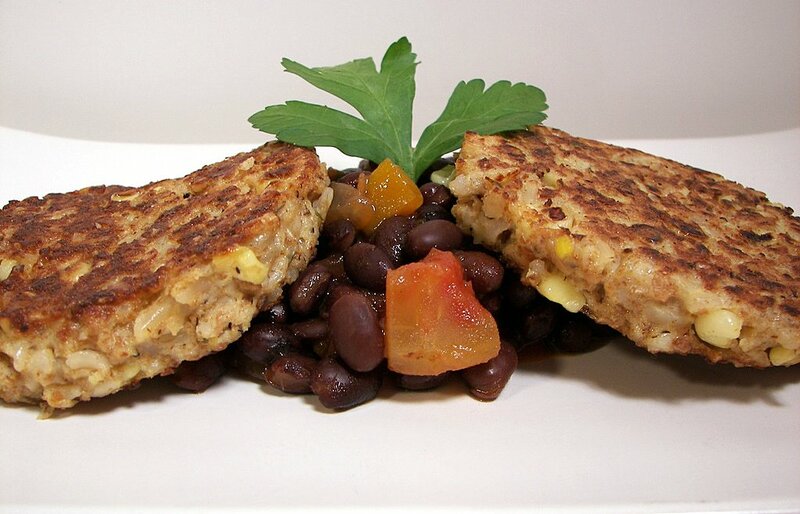 On to dinner tonight... we heated things up tonight with a dish of Rice and Corn Cakes with Spicy Black Beans. 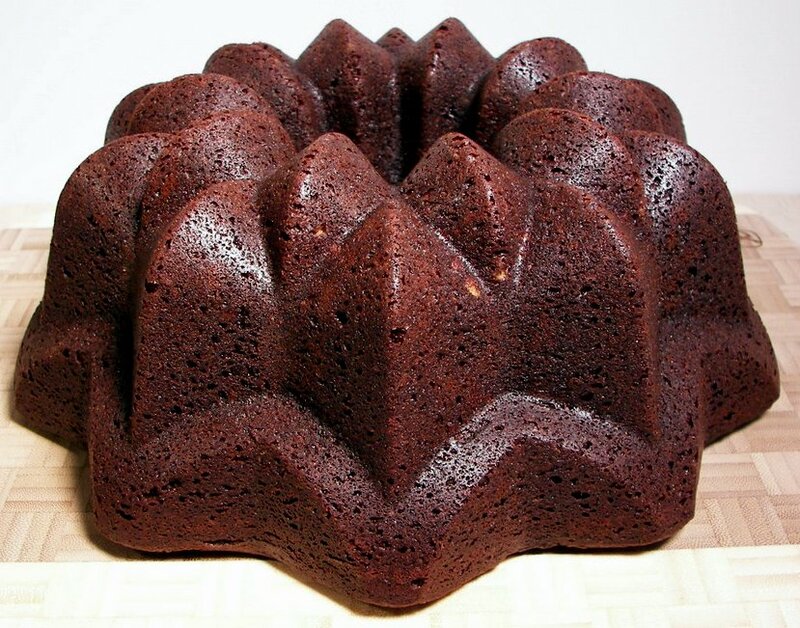 To make things easy, instant brown rice is used to form the base of the cakes. To perk up the flavor of the rice when it cooks, scallions, garlic and fresh thyme are added before the water comes to a boil. Once the rice is done, corn kernels and fresh whole wheat breadcrumbs are added and the mixture sits to cool down for a couple minutes. This mixture is then mashed with a couple eggs to bind to together. I found the mixture to be pretty loose, but I was still able to form them into cakes and get them in the pan without falling apart. They are then cooked until each side achieves a golden crisp crust. While they brown, a mixture of drained black beans and salsa (use whatever kind/heat level you wish - I used Trader Joe's Chipotle and Lime salsa... it is quite spicy!) is warmed in small saucepan to be served with the cakes. 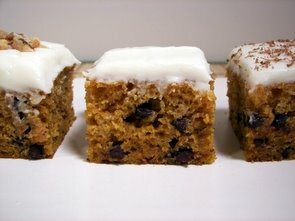 The moist cakes with the spicy beans made for a very filling dinner that left our tastebuds dancing around to cool off. While the kitchen is still a disaster from the remodel-in-progress, you will soon begin to see we have set up the stove so I can use it again. I went full steam ahead in taking advantage of having it working - I began by making another batch of the new favorite hamburger bun recipe. I love working with this dough and it has not let me down yet! Jeff loves hush puppies from Long John Silvers... but, we rarely eat there. It is usually for a once in awhile (maybe once or twice a year) unhealthy splurge as we typically eat pretty healthy and I make most of our meals. I thought I could surprise Jeff and try a recipe I found for Baked Hush Puppies! While they are obviously not the exact same since they are baked and not fried, Jeff was really impressed with how close they did taste like them! They do have an unusual special ingredient and I had Jeff guessing for quite a long time trying to figure it out. I ended up having to tell him what it was... crushed rice krispies! 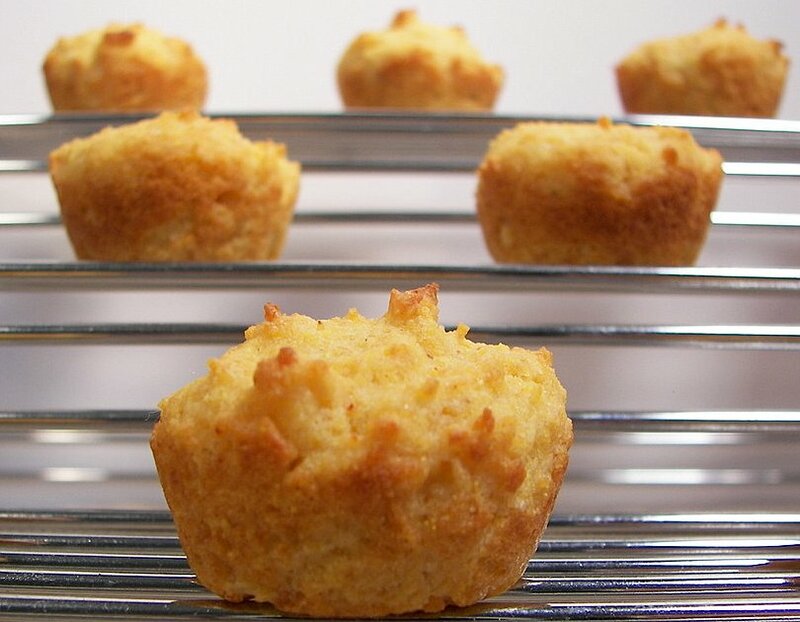 The batter is baked in a mini muffin tin and comes out of the oven with a rich golden and pretty crisp crust. The inside is light and moist with a bit more spice to them than at Long John Silvers. I think I liked these better as they are not heavy and greasy - Jeff has already asked me to make them again! I find myself making more and more soups lately as the weather cools down - so to go along with the hushpuppies, I made a Lasagna Soup. This soup is filled with spicy hot Italian turkey sausage, onions and carrots. 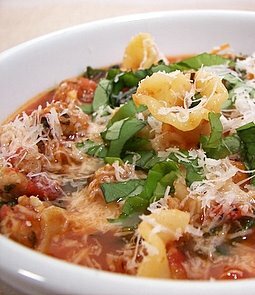 Boosting the flavor in the broth and tomato combination is minced garlic, basil, oregano and red pepper flakes. For the noodle part of the recipe, I opted to use Campanelle pasta - the pasta is quite striking to look at, they are small with fluted edges and have a hollow center. Once the pasta is tender, chopped fresh spinach is thrown in to wilt down. For a fun twist to the recipe, cubed provolone cheese is placed in the bottom of the serving bowls right before the soup is poured in. 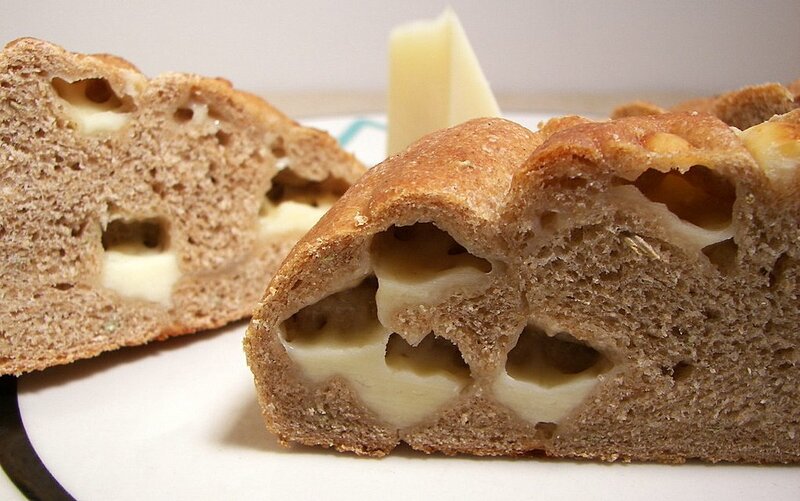 As you dig in, you get small pockets of gooey melted provolone in each bite - such a good way to distribute the cheese in this recipe! Sharp Parmesan is grated on top with strips of fresh basil to finish the dish with a burst of flavor. Jeff and I both commented on how much it did taste like lasagna, albeit a soupy one! I wish I would have doubled the recipe to freeze for lunches later in the week - it was that good! The pups have been sad... but we changed that today! 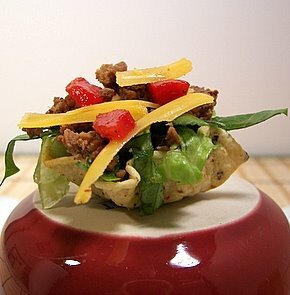 Well, 7 new recipes this week - but if you count the Mini Tacos, then it could be 8! 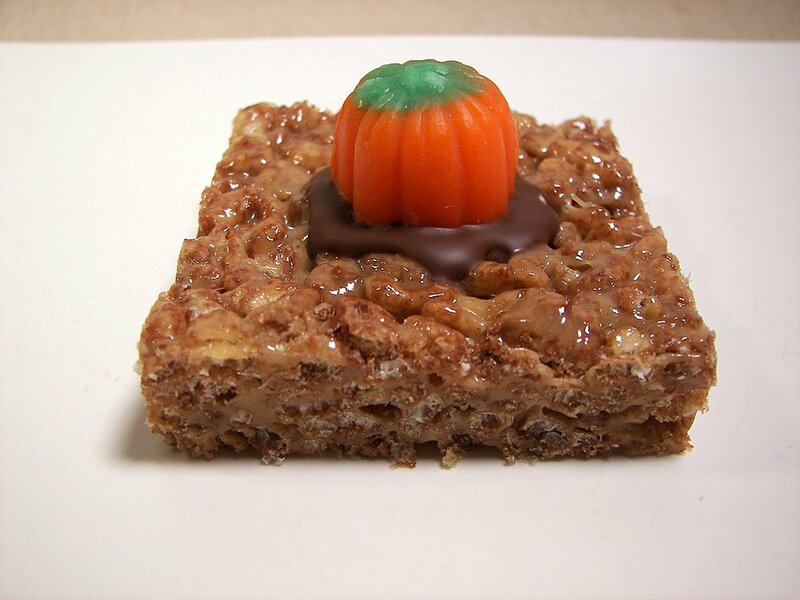 The stand-outs for us were the Caramel-Toffee Crunch Bars and the Chewy Chocolate Gingerbread Cookies. 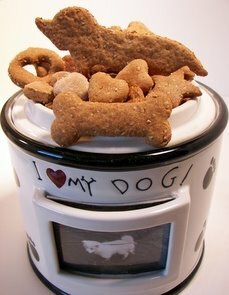 The poor puppies have been without any homemade snacks for a few weeks now - they finished up their pupcakes before the remodel started, so I thought I should set aside some time today and make them some new treats. I made a crunchy biscuit type this time - I was going to go with a peanut butter flavor, but that will be the next one as we went for some Chicken and Honey Doggie Biscuits today! As with this one, most recipes are pretty simple - they do make a lot, but you can keep them for a long time in the freezer and you can make whatever size or shape you like. 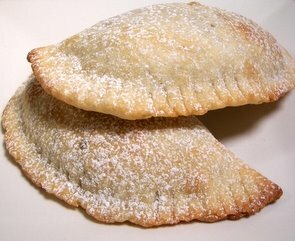 The dough for these are made with whole wheat flour and cracked wheat - we flavored them with chicken broth, sweet honey and fresh minced garlic. Though there is yeast in the recipe, you don't need to wait for the dough to rise or anything - this just gives them a little lift in the oven. I used mostly medium-sized cookie cutters, but I did use a small one to cut the dough into mini hearts as Jeff wanted some small bits to use in training with Max. 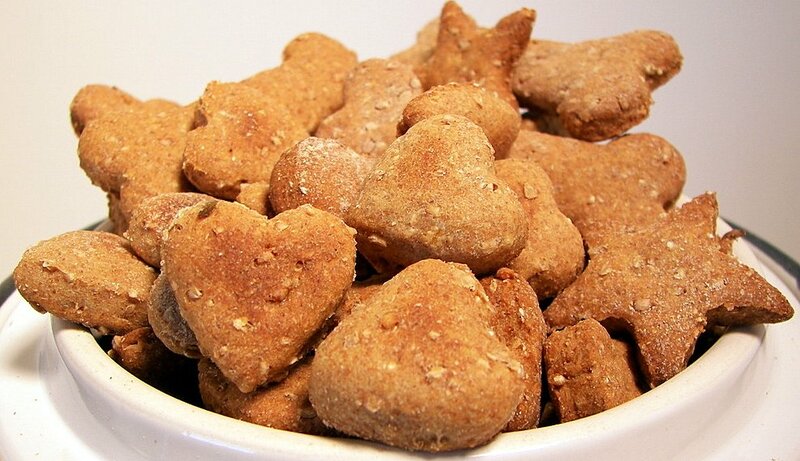 You could dip these in melted carob chips if you want to give them a fancy finish - Spike and Max seemed to think they were plenty tasty as is! Max was so happy, we think he passed out from excitement! The house next door to us was on the market when we bought this one and it finally sold a few weeks ago. The new neighbors moved in, so I thought we could make something nice to bring over as a proper welcome. I ended up making Chewy Chocolate Gingerbread Cookies as they sounded like they would be a little different than your everyday gingerbread. I thought what really set these apart is the addition of fresh grated ginger root as you begin creaming the ingredients. 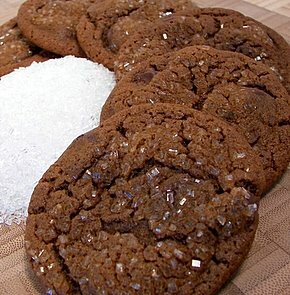 Dark brown sugar and molasses are the sweeteners, so they have quite a deep and rich flavor background. The chocolate comes into play in the form of a single tablespoon of cocoa with about a cup of chunky bits of bittersweet chocolate. The dough is a little fussy as you need to chill it twice - I found it to still be little sticky, even with the 2+ hour refrigeration. When you roll the dough into balls, you can either lightly flour your hands or use wet hands - I choose the former as it was easier for me. Once the balls of dough are chilled, I rolled just the tops in very coarse crystal sugar for a touch of sparkle to finish. These baked up into beautiful, thick and crackly-topped cookies with a definite chew to them. The bitter chocolate and fresh ginger make for a great pair in these spicy cookies. We bought our toaster oven about a year and a half ago and I can't believe how much I end up using it. It has been great for toast, re-heating leftovers and making some dinners - but I had not used it much to bake in it. It has gotten a workout though in the past couple weeks! I've been wanting to make some muffins for mid-morning snacks and played around with a recipe a couple days ago which ended in these Gingered Pumpkin Muffins. This recipe has been floating around and I'm not sure where it first originated, but it has great potential as base for several variations. 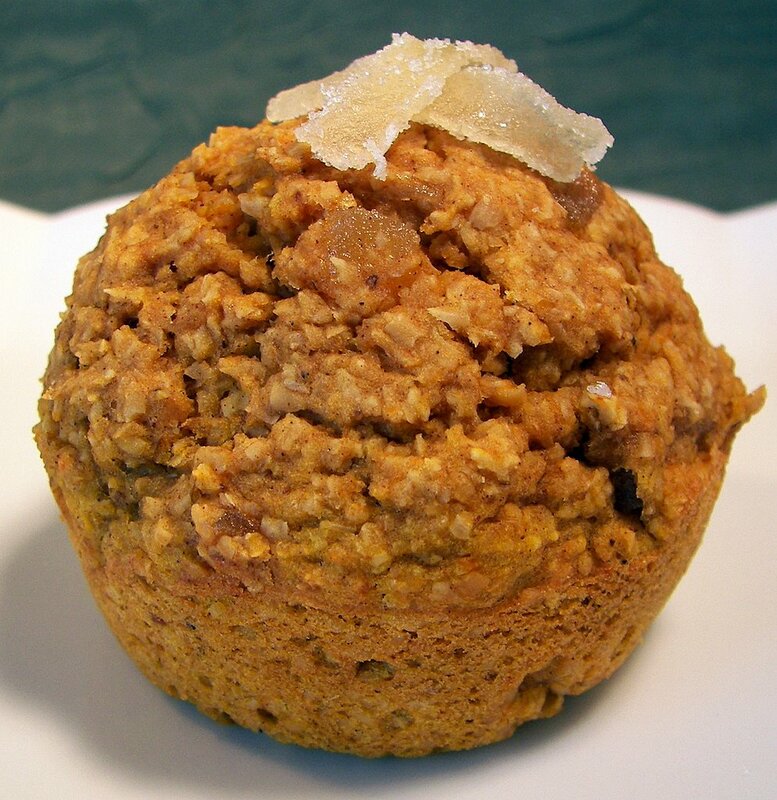 Making up these healthy muffins are ingredients such as whole wheat pastry flour, oat bran, mashed pumpkin, a single egg white and just a tablespoon of oil. It may sound like they would turn out heavy, but we thought they were fairly light and moist with a definite fall appeal. They certainly filled the house with a pleasant aroma as they were spiced with cinnamon, ginger, allspice and nutmeg. Diced crystallized ginger adds a spicy bite with dark brown sugar bringing a rich sweetness. I only made 5 muffins so I could use my 6 cup muffin pan that fits in the toaster oven. They baked up just as well (if not better...) than the big oven! Although, the house could have used the extra warmth from using the oven... these chilly temperatures are going to take awhile to get used to again. While I did grow up in Minnesota, spending over 2 years in Phoenix sure makes it difficult to adjust! While we do quite enjoy having leftovers, especially when one is without a kitchen, I needed a break from them and had to make something different. I didn't have a recipe in mind for tonight, so I just looked in the pantry/freezer to check out what we had already on hand. I'm sure you have seen the tortilla chips from Tostitos called "Scoops" right? They are basically tortilla chips in the shape of little bowls. They have finally come out with a baked version that we snapped up at the grocery store this past weekend. 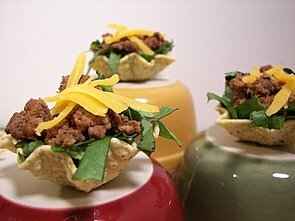 So, in an effort to try them out, I put together some fun little taco bowls. No recipe really, but I started out with some fresh garlic in a little olive oil and then added some ground sirlion. I seasoned the beef with chili powder, cumin, paprika, salt, pepper and a couple splashes of Frank's red hot - I didn't measure much, but tasted as I went. 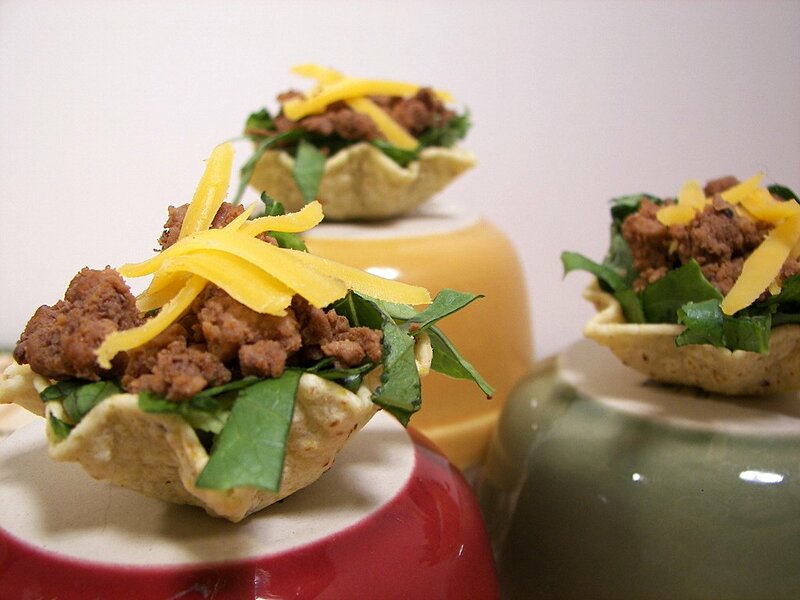 Once the sirlion was browned, we filled the little cups with shredded romaine, the seasoned beef and shredded sharp cheddar. I did add a few bits of diced roasted red bell peppers to about half for color since as I was out of our favorite salsa, but I imagine a bit of that and some sour cream would make these groovy one bite tacos even better! Here's a sneak peak at a gingery pumpkin muffin I made the other day in our handy toaster oven - I'll talk about these treats tomorrow! So last Wednesday I was feeling a little guilty that we were not able to do anything for Jeff's co-workers, since that is known as Treat Day around his office now. I knew I wanted to do something, but I didn't want to do any plain-jane treats (which can be mighty tasty on their own - nothing wrong with that). We then started to think what we could do to funk-ify some treats. I ended up making two recipes using that not-so-great burner in the middle of the living room. The first, Chocolate Peanut Butter Krispie Bars, is just your basic krispie bar recipe execpt I used cocoa krispies and added creamy peanut butter to the melted marshmallows. To add a fun festive touch, I dropped a dab of melted chocolate on each bar and placed a candy pumpkin in the center. Hard to go wrong with a crunchy chocolate bar that has a background of sweet peanut butter flavor in each bite. Who says you have to use marshmallows to make krispie bars stick together? The next recipe, Caramel-Toffee Crunch Bars, uses the little caramel cubes you can buy in the store that would normally be used for caramel apples (or, of course, eating them by their tasty selves). The cubes, butter and a touch of water are slowly (thanks crappy burner!) melted until smooth. 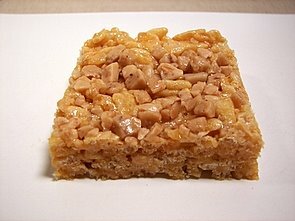 You then add plain ol' rice krispies with a 1/2 to 3/4 cup of crunchy toffee bits. I found this comes together a little easier than with melted marshmallows and you had more time to work with the mixture before it begins to set. After they are patted into a pan, I scattered the slab with additional toffee bits and gently pressed to adhere them. These are obviously a little more rich and have a wicked chew to them compared to the chocolate ones. 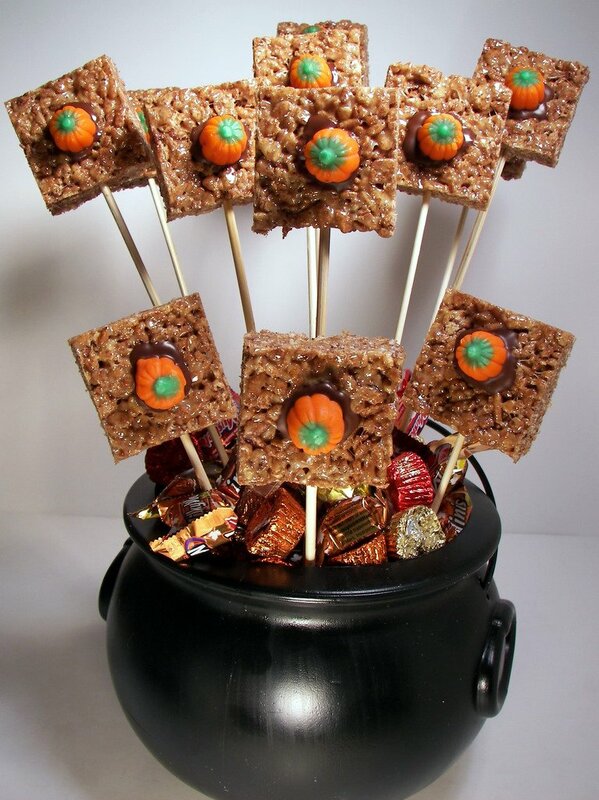 Being a little silly, I thought it would be fun to bring a "display" of them with the rest of the cut bars in front... so I skewered the chocolate ones as the caramel-toffee bars were too soft. We busted out the glue gun and added some green floral foam inside of a cauldron we picked up this weekend. After we stuck the bars in, I filled the empty area with some tasty mini versions of Reese's, Milky Way Midnights, Twix, Three Musketeers and Snickers. We had a hard time trying to take a good picture, but here's one anyway to see how the cauldron ended up. Well it cooked the pasta... but was it worth it? Don't wait to pick your pumpkins!